Cotton plant. Source: Wikimedia Commons. To paraphrase Wikipedia, cotton is a soft, fluffy staple fiber, comprised of almost pure cellulose. Although the individual fibers have low tensile strength, cotton is very versatile once it’s spun into a yarn. Yarns made from cotton can be used to make a huge variety of fabrics – from sheers such as lawn, gauze and voile all the way through to sturdy duck and canvas. It can be used in almost any garment you can name – from cotton flannel PJs to denim jeans – and has a whole bunch of non-clothing applications too, from tent canvas to tea towels. There’s a reason we’ve been using it for so long. 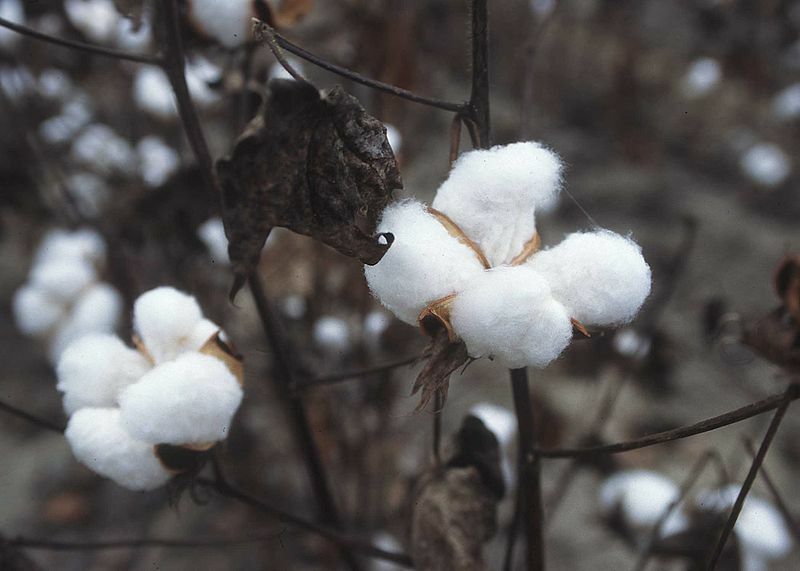 Although the cotton boll on the plant looks like it’s pure white, untreated cotton fabric is an off-white color. Sheer bright white cotton has been bleached. Update: naturally colored cotton does exist (I learn something new every day – Ed.). Although it’s more expensive to grow than regular cotton, the grower gets a trade-off in not having to use dyes on the fiber, which cost money and could have a negative environmental impact. More about naturally colored cotton. A common costuming use for cotton is to utilize a lightweight plainweave fabric of pure cotton – muslin – to make a mockup of a garment to test the fit. That fabric’s use is so ubiquitous that the process of creating a mockup is often called “making a muslin”. Another term you’ll encounter is “making a toile” – toile being a fashion industry term for a test garment. White and undyed cotton can be washed in hot water. Dyed cotton should be washed in cold water, unless you’re really sure about how colorfast the fabric is. Really sure. The quality of cotton yarn relates to the length of the fiber used to spin it (such plant fibers are also referred to as staples – long, short, medium, etc). Longer staple fibers are smoother and stronger and used in higher end fabrics and finished goods. There are several marketing terms used to describe higher-end, long-staple cotton: Egyptian, Pima, Supima and Sea Island are the most common. As a natural fiber, cotton can and will shrink. Notice how your jeans always fit just a bit more tightly when they’re fresh out of the dryer? That’s why. Unlike wool, cotton will shrink a certain percentage and then stop. Many cotton fabrics you’ll find for retail sale have already been shrunk most of the way, or chemically treated to reduce shrinkage. Heat and water are what shrinks a fiber and while most fabrics from the store will claim that they’re “pre-shrunk”, you should always wash your fabric how you intend to wash the finished garment, and dry it the same way, before you cut it. Even if you plan to handwash the finished garment and lay it flat to dry, do that to your un-cut fabric. It’ll help wash off any chemical residues from the textile mill and potentially save you from unpleasant surprises down the road. Because it’s a plant fiber, cotton is relatively easy to dye at home.